The office at Eldridge Body Shop, Inc.
is open Monday – Friday, from 8:00a.m. – 5:00p.m. Estimates are free and you can stop in anytime at your convenience. The quality of the repairs is outstanding, the service is second to none and the staff most courteous and professional. This is my fourth repair here and would never go anywhere else…..Peter M.
WONDERFUL, FRIENDLY, KNOWLEDGEABLE (definition: intelligent, well-informed) and EFFICIENT STAFF WITHOUT EXCEPTION – plus you do EXCELLENT work – you have helped me out on several occasions and I have always been 110% satisfied – despite the circumstances …..Deirdre F.
My wife’s car was completed ahead of schedule and the work was excellent. Couldn’t have been better. In the past I’ve had some real problems with body shops, but not Eldridge. You set the standard for all shops to copy. Thanks ……L.M. I am so impressed with the professional service and courteous staff, it was well worth the hour and a half drive to get my car repaired. So satisfied we are bringing my husband’s car in for some cosmetic repair this week! Thank you so much!…..Karyn Z.
I speak highly of your craftsmanship to all my friends. I certainly will be a lifetime customer although I hope to never have another accident…….Wayne I. Unbelieveable!! I am a Family Business Consultant and rarely do I find one as professional, cusotmer oriented and well run as yours……Bruce V.
I’ve been involved with the auto industry for 30 years and have a critical eye for quality workmanship, material, and paint. Based on my first experience with Eldridge I’m very impressed with the operation and workmanship,…….Frans C.
Extremely happy with the results of the repair. Surprised and extremely pleased with the “extra care” given (entire vehicle was washed!) Excellent customer service; very professional and curtious! Definately will recommend Eldridge Body Shop to all!…..Howard & Marsha H.
I’d like to thank the entire staff of Eldridge for taking such good care of my car and being so helpful when my car was in an accident. My car was repaired with superb quality and done very quickly, so I was able to get back to my normal life….Vanessa P.
Since I live in Orlando, Wilde Honda brought my car to you so I only talked to you by phone. Everyone I spoke with was SO nice and my daughter’s car looks fabulous. Dave… kept me updated and was so nice and helpful. Wilde Honda HIGHLY recommended you…..Nina E.
…….this is our 2nd very positive experience with your shop. excellent customer service. you set a standard for other business and organizations to follow. thanks again……Terry L.
Front desk staff was very helpful and friendly. Very pleased with workmanship. Repairs always finished when promised. I am a repeat customer and with the service I receive will continue to be one! Thank You!…..Aileen M.
We have used your body shop on three previous occasions and have been more than satisfied with the workmanship and quality of your service. Our vehicles have been returned to us without having any evidence of damage. Whenever anyone asks for a reference……Don C.
I have never seen a business run so smoothly and friendly. The waiting room- first class, the office staff- first class,….the body shop-first class, very neat and clean, the body shop work-first class. My car received the white glove treatment……Essie F.
Here are some very valuable additional tips and information for you. An estimate is just that – the estimated cost involved in repairing your vehicle to its pre-accident condition. Repair estimates may vary depending on several factors such as: labor rates, material rates, parts prices, computer systems utilized, amount of time to perform certain repair operations, hidden damages, etc. The main elements of a repair should be included on the initial estimate, but supplemental items may need to be added in order to repair your vehicle properly. A supplement is anything added to the original estimate that is necessary to repair your vehicle properly. Your vehicle may have damages that were not visible when the initial estimate was written. Hidden damages may require additional parts and/or labor. There may also be variances in parts prices. If you have submitted an insurance claim, we will contact the insurance company and resolve any supplemental issues. If you are not going through insurance, we will contact you directly with supplemental issues. ONE. You are the owner of the damaged vehicle and you have the right to select the repair facility that will be working on your vehicle. Your primary concern should be selecting a professional shop that is highly qualified to restore the safety, appearance, function and value of your vehicle. If you are shopping for price by obtaining several estimates, remember that price is not the only thing to consider. Most insurance companies have their own appraisers that evaluate the damage to your vehicle. If you are going through insurance, their estimate is the only estimate necessary. Eldridge Body Shop, Inc. will utilize the insurance estimate as a starting point and will contact them directly with any supplemental issues. Which insurance companies does Eldridge Body Shop, Inc. work with? Why would an insurance company tell me to have my vehicle repaired elsewhere? All consumers have the right to have their vehicle repaired anywhere they choose and to have repairs performed correctly. Some insurance companies will attempt to recommend, encourage, or otherwise influence a consumer to use a repair facility selected by the insurer. Usually these shops are part of a “referral program” and are frequently required by the insurer to use lower cost non-original parts, limit the scope of repairs, or use other cost cutting procedures which may not truly restore the safety, appearance, and value of your vehicle to pre-accident condition, and which may jeopardize your factory warranty. Eldridge Body Shop, Inc. works for you, the consumer, not the insurance company, and insists on only repairing your vehicle properly! How is payment for repairs handled? All repairs must be paid in full before the vehicle will be released. The vehicle owner is ultimately responsible for payment. If you have an insurance claim, it is most common for the insurance company to issue payment directly to the vehicle owner. If you have not received payment from the insurance company, it is advisable to call them right away. Eldridge Body Shop, Inc. does not do any billing. What are some things to consider when selecting a repair facility? Choosing the right repair facility will be critical to your safety, satisfaction, and peace of mind when you get your vehicle back. 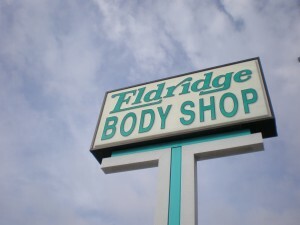 Eldridge Body Shop, Inc. has been family owned and operated in Sarasota since 1978. Eldridge Body Shop is equipped with all of the latest sophisticated diagnostic and repair equipment, refinishing systems, and staffed with highly trained technicians. The labor work performed by Eldridge Body Shop is guaranteed against any defect in workmanship for as long as you own your vehicle. The Eldridge family and all of its employees take great care to insure that every repair meets “OUR” standards for quality.